Lately, I've been finding myself following countless of Australian bloggers. I love watching their Instagram stories and checking out the enticing Aussie food scene, simplistic clothing brands, and minimalistic, yet girly, home decor style. There are so many brands of natural beauty products and candles that I am itching to try (go away, shipping costs!!). While we are here pulling on winter boots and bundling up for extremes, they are headed off to the beach and enjoying their current summer months. Depressing to watch, I know! 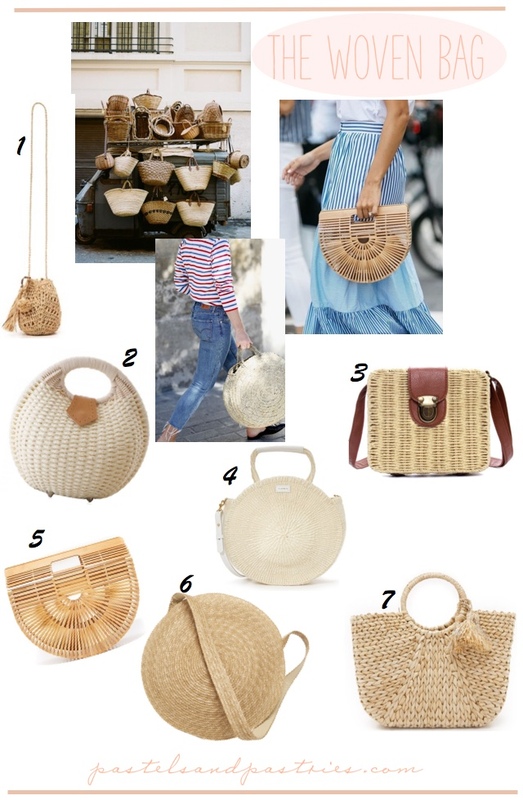 One thing catching my eye through their feeds is the influx of woven bags and were not just talking not the typical straw tote, but completely different, interesting vintage looking styles. I love the look of a woven clutch paired with blue and white. There is something so South of France about it. Some of the price tags on these bags are a little way to steep for my liking so I turned to one place I knew would inspire me to create my own, Value Village! I can't wait to show you show I DIY'ed some straw accessories in a woven clutch, but for now, have fun lusting after these beauties with me. I love all of these!! I will admit I am pretty obsessed with them right now as well. They are so fun right?! I'm in love with the circle shapes! These woven bags are gorgeous! I'm especially loving number 5 - it's so different! Me too! Such a cool design!